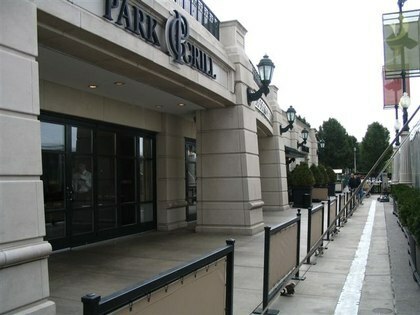 I arrived early at Park Grill for my luncheon with Paula Drake of Tutus Divine, before the matinee performance of the New York City Ballet's Masterworks program (See the review). While I waited for Paula to arrive, I looked around the grounds, which were buzzing with activity. 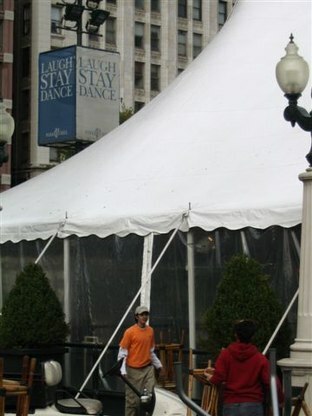 The next day was the Chicago Marathon and the terrace in front of the Grill had been tented and decorated for private parties after the run. In warm weather, café tables and chairs, and a bar, fill the ample space and during the winter, there's a skating rink at that same spot. The reservation I'd made was a good idea; the grill quickly became jammed with a lunchtime crowd. We were seated at a window booth a step up from floor level, in the casually elegant divided room. While we looked at our menus and talked about Paula's costuming business and ballet, our servers, George and Samuel, brought some lagniappe, a cone basket of artisan bread and little pots of olivada and whipped butter. 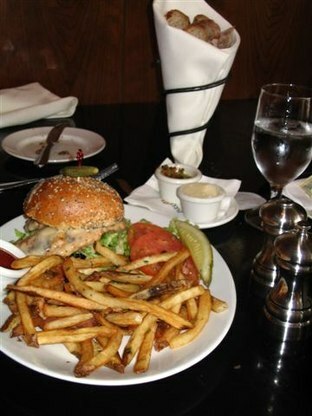 The classic American menu offered choices from sea to shining sea. There were: lobster corn fritters; Asian, onion and pumpkin soups; Caesar, chopped, poblano, steak, and squash salads; Portobello sandwiches and burgers of beef and lamb; and a variety of fish and pastas. Specials included an entrée I'd never seen before: Atlantic skate wing. Desserts, which I never eat, still tempted me with such unusual inventions as Gianduia, a frozen hazelnut soufflé and a chocolate peanut butter tart. Paula selected the poached cherry and duck breast salad. It arrived with medallions of duck, pink and juicy at their center, nestled on a frizzled bed of leafy greens and polished with a poached cherry vinaigrette. I regretted ordering my usual grilled chicken sandwich until the Cajun spiced breast arrived. It overwhelmed the egg bun and nearly overlapped the plate it was so large. I opted to cut the sandwich into bite-sized pieces in an attempt at neatness. It was delicious. Thick and flavorful with a hint of spice, the tender breast was perfectly cooked. Between bites of chicken and salted French fries with an endless glass of iced tea, I almost didn't have room for dessert. But the calvados apple pie had caught my eye, so I suggested to Paula that we split it with our coffees. The size of the "pie" not a traditional wedge, but in the round, gave us each a few bites of melded apple and currant mixture, crumble topped and sided by a dollop of caramel ice cream. Good, fresh coffee cut the sweetness, and well satisfied, we strolled the short distance to the Harris Theater in good time, thanks to our waiters' well-timed service. 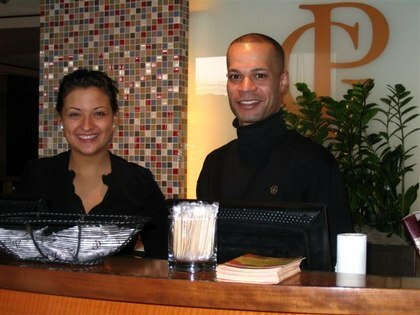 Eating at Park Grill was the perfect choice for proximity, attentive service and delicious food before our theater engagement. I'll look forward to having a magnificent view of Michigan Avenue and impromptu skating entertainment as well, with the changing season.